Wallauer’s Design Center is proud to carry Hunter Douglas window fashions, the leaders in innovative window coverings. Every Hunter Douglas window fashion is custom built expressly for your windows and manufactured according to the highest standards of quality. To achieve this, Hunter Douglas has developed a vast collection of proprietary products, fabrics, color, textures operating systems and specialty hardware. 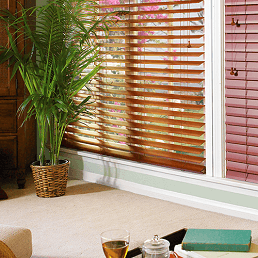 Learn more about the different Hunter Douglas window fashions below. Roman shades are different from standard shades because they are visibly smooth when opened. These shades are not bumpy or ribbed, like typical vertical shades, and stack up evenly when closed. It’s easy to get creative with new custom, soft Roman shades from Hunter Douglas Design Studio! Choose from 4 distinctive Roman shade styles, each designed and crafted with Hunter Douglas quality and innovation. Cellular shades are the perfect option to block or filter light and insulate windows to save energy. Unlike window blinds, which are made of hard materials, cellular shades are made of a soft paper or cloth-like material. 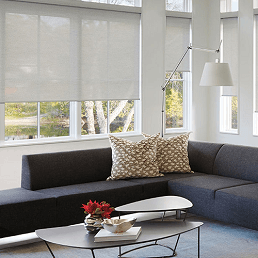 Cellular shades can be constructed as single-cell, double-cell or triple-cell shades. One of the most popular options for sliding glass doors, vertical blinds provide wonderful light control no matter what your budget may be. Smooth or embossed, decorative fabric or faux wood — there’s a wide variety of materials to choose from to help match your personal style. Roller shades are known for their simple functionality. 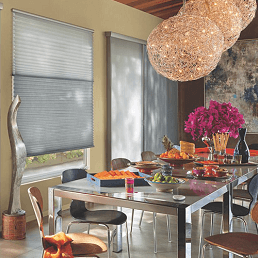 Hunter Douglas’ roller shades come in hundreds of fabric choices to choose from. From sheer to opaque, patterned to textured, as well as traditional solid colors, there’s a perfect option for you no matter what your style may be. 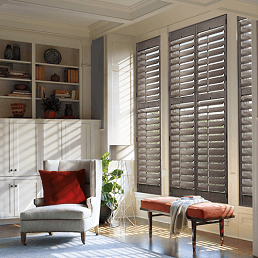 From café shutters, to tier-on-tier, to full-height options, Hunter Douglas has the perfect window shutters that best suit your home. A vast selection of frame choices, specialty shapes, configuration options and louver sizes gives you one of the largest selections in the industry. Sheers and shadings are the perfect option if you’re looking to utilize natural light. By using lightweight fabrics and horizontal fabric vanes, you can create beautiful effects in any room of your home. Hand-woven from versatile, light-filtering woods, Hunter Douglas’ woven wood shades come in four unique styles and transform sunlight into captivating design statements. It’s the perfect option to add a warm, natural look into your home! 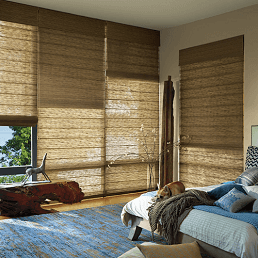 While horizontal shades are one of the most common blind options for homeowners, yours will be anything but ordinary when you choose Hunter Douglas! 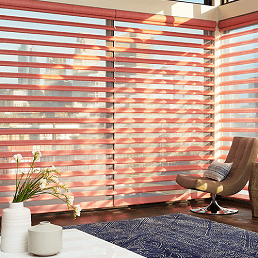 Whether you’re looking for wood, wood alternative or metal shades, Hunter Douglas offers a wide variety of horizontal blinds to fit your home’s needs. Whether you’re a new homeowner in Westchester, Putnam, and Rockland or you’re looking to breathe a new life into your space, achieve a beautiful home with help from Hunter Douglas and Wallauer’s. No matter which one of our 17 locations you visit, our design staff will help you find the best product for your home. For more information, please contact us today. Your Space. Your Taste. Your Lifestyle. Wallauer’s design staff is committed to quality and service providing our customers with the newest in color schemes and the latest in design products. We give our customers the one on one attention they de serve in the store or in the convenience of their home. We listen to their ideas and needs to design space that reflects ones personality creating a functional and comfortable environment. Barbara was great. She listened to my needs and made valid suggestions. She was very knowledgeable about the products and brought samples to show me what she was talking about which was very helpful. Kim S. and her whole team at Wallauer’s in North White Plains, NY has been working for us over the course of 8 years. Whether it’s picking a fabric, covering old/new furniture, selecting paint colors or window treatments, they can do it all with creative style. They have a knack for quickly learning your taste and then take you one step further by showing you things that you wouldn’t necessarily have thought of but look amazing! I will always use them for my home decorating needs. I am a designer have worked with Laura at Wallauers for almost 8 years. She has worked with me on countless projects. The library at Walauers is extensive and has every fabric, trim, wallpaper you can find in the D&D building. Laura’s knowledge of all the products they offer is endless. She has an amazing eye and she is excellent at knowing what you are looking to achieve and helping you find the product to do so. Her design skills are spot on. Beyond that she is a master at staying on top of every project you are working on with her and coordinating installations, shipping, samples etc. All installers I have worked with have been knowledgeable, professional and a pleasure to work with. I have had only had happy clients and am a client myself. I can not speak highly enough about Wallauers in Bedford Hills, Laura and all of the staff. If you haven’t been in before you should make it your first stop and it’s worth the drive if you aren’t local. I have done business with this store for well over 10 years and they always have been professional and have given me good service …. and yes, I am a female. Please do be aware that the paint department does deal with a lot of contractors so you have to realize that early morning and late afternoons are going to be a bit more hectic. If you have lots of questions, probably not the best time to go, but they have always done a really good job of answering my questions(even during those hours) as long as I am not long-winded or indecisive….. I also have used the Port Chester and Bedford stores quite a bit …. all are good… I am a big fan of ACE hardware so it will be interesting to see how that marriage works.